The planet Jupiter is a wonderful example of the creativity of the Lord. It is remarkably different from the worlds we have examined previously in this Impact series. Jupiter does not possess a solid surface but is an enormous spheroid of gas—eleven times the diameter of Earth—held together by its own gravity. The gas pressure increases with depth, eventually becoming liquid. The fifth planet away from the sun, Jupiter is composed primarily of hydrogen and helium, the same gases that comprise the sun. However, the much cooler temperature of Jupiter allows the formation of molecules such as ammonia, water, and methane from various trace elements. These molecular compounds create Jupiter’s colorful cloud formations. Jupiter is massive—the equivalent of 318 Earths! If we could put it on a scale, it would weigh more than twice as much as all the other planets combined. Jupiter is so massive that its gravity slightly, but noticeably, affects the motions of the other planets. Astronomers must factor this into their computations when predicting the precise positions of planets. Due to its large size, the disk of Jupiter is easily visible with virtually any small telescope, or even through good binoculars, despite being 500 million miles away from Earth. A number of Jupiter’s properties are consistent with its biblical age of about 6,000 years but are difficult to explain via frameworks that adhere to a multi-billion-year-old solar system. One of these is its strong magnetic field. Since magnetic fields naturally decay with time, it is hard to understand how Jupiter could maintain such a powerful field over billions of years. Another indication of youth is Jupiter’s internal heat. Jupiter emits nearly twice the amount of energy that it receives from the sun. Like popcorn fresh out of the microwave, planets gradually cool as they radiate heat into space. Jupiter is large enough to do this for thousands of years. But if it were really billions of years old, why hasn’t it cooled off by now? Jupiter is an ideal target for a small backyard telescope. The planet is easy to find because it is extremely bright—only Venus is brighter. Jupiter shines through the most light-polluted city skies and always puts on a good show, revealing detailed cloud features to viewers. Powerful winds stretch the clouds into colorful “belts” and “zones” that encircle Jupiter parallel to its equator. Belts are the dark brownish-orange features and zones are lighter in color.1 Like Earth’s jet streams, these clouds mark the differential rotation of Jupiter’s atmosphere. Typically, the Northern and Southern Equatorial Belts that sandwich Jupiter’s equator are the most visible. But with larger telescopes under good viewing conditions, it is often possible to see several thinner belts and perhaps even small disturbances taking place within them. Unsurprisingly, these cloud formations are dynamic, changing from year to year, growing or shrinking slightly, and experiencing subtle changes in color. Occasionally, a belt disappears completely for some time. This happened to the Southern Equatorial Belt in 2010, radically changing the appearance of Jupiter until the belt returned in 2011. Since it never looks exactly the same way twice, Jupiter is always fun to watch. The Great Red Spot, a large, somewhat permanent feature just below Jupiter’s Southern Equatorial Belt, is of particular interest. The Red Spot is a storm vortex, essentially a hurricane, roughly twice the width of Earth.2 Hurricanes on Earth are powered by warm ocean water and dissipate when they move over land. However, since Jupiter has no land, its Great Red Spot continues indefinitely. At least 349 years old, this magnificent storm was first discovered by Robert Hooke in 1664. Before this time, telescopes were not optically sufficient to discern such features, so the Red Spot may actually be much older. Despite its name, the Great Red Spot is currently more of an orange hue and its color changes with time. In the 1990s it had turned a light pink color, reducing its contrast and making it very difficult to see through backyard telescopes. Though it has darkened since then, the spot is not always easy to see. Since Jupiter rotates, the Great Red Spot is on the other side of the planet and impossible to see 50 percent of the time. But even when on the Earth-facing side of Jupiter, the Great Red Spot is hard to see near the limb (the edge of the disk). The best view is when the spot is said to “transit” or pass near the horizontal center of the disk, an occurrence predictable up to a month or so in advance. Viewers can find upcoming transit times posted on various astronomy websites. Jupiter rotates in less than 10 hours—faster than any other planet. 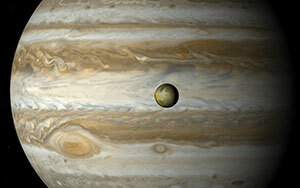 This rapid rotation, combined with the extraordinary size of Jupiter, causes the planet to bulge at the equator. Even through a decent backyard telescope it is clear that Jupiter is not exactly round. Such rapid rotation also means that if you view Jupiter twice in one evening separated by a couple of hours, you will get a different view on the second pass since Jupiter will have undergone one fifth of its rotation. The effect is particularly noticeable when the Red Spot is near Jupiter’s center. Jupiter itself is wonderful to view in a small telescope, but the observer will also be struck by the presence of four beautiful, bright “stars” that are always near Jupiter and aligned with its equator. These are moons—natural satellites that orbit Jupiter. They always appear in a nearly straight line because they orbit in the plane of Jupiter’s equator, and we see the Jupiter system from nearly edge-on; it is the same reason a Frisbee looks like a straight line when viewed from the side. These four moons are even bright enough to be seen in binoculars. They were the first moons discovered orbiting another planet, a discovery that changed our view of the universe. Before Galileo constructed his own telescope in 1609 and began peering into the heavens, no one had considered the possibility that other planets could have moons. As far as anyone knew, there was simply the moon that orbits Earth. At that time, most astronomers believed that everything orbited Earth, including the other planets and the sun—this is known as a geocentric view. When Galileo first pointed his telescope at Jupiter, he was delighted to discover four new worlds never before known by anyone other than God. What a moment that must have been!3 And by observing these moons night after night, he could clearly see that they were orbiting Jupiter. This strongly refuted the geocentric claim that everything must orbit around Earth. Galileo had found a clear counterexample that paved the way for increased acceptance of the heliocentric solar system—the notion that planets, including Earth, orbit the sun.4 In honor of their discoverer, these four moons are now called the Galilean satellites. In order of increasing orbital distance from Jupiter, the Galilean satellites are named Io, Europa, Ganymede, and Callisto. Unlike gaseous Jupiter, these moons are solid bodies composed of rock and ice. Jupiter and its moons are like a miniature solar system with the inner moons orbiting faster than the others. Io takes only 1.77 days to orbit Jupiter, and the orbital periods of Europa, Ganymede, and Callisto are 3.55 days, 7.15 days, and 16.7 days respectively. Notice the pattern: Europa’s period is twice that of Io, and Ganymede’s period is twice that of Europa. This is an example of orbital resonance.5 Callisto alone is not in resonance. Using a small telescope, it is possible to actually see these moons orbiting over time. If you made a careful mental note of the positions of the Galilean moons at a given moment and then looked again an hour later, you might notice that their locations appreciably changed. To see celestial objects change so drastically in such a short time is a rare delight. The Galilean moons are comparable in size to Earth’s moon. Io is 2,264 miles in diameter—only five percent larger than the moon. Europa is 10 percent smaller than our moon, and Callisto is 39 percent larger. Ganymede is the largest moon in the solar system at 50 percent larger than Earth’s moon. Ganymede is even larger than the planet Mercury! So, if this moon orbited the sun directly instead of Jupiter, it would certainly be classified as a planet. Due to its larger surface area, Ganymede appears noticeably brighter than Io and Europa and slightly brighter than Callisto. Each of the Galilean satellites is an amazing world, but Io is the clear winner in terms of its unique qualities. High-resolution images of Io taken by the Voyager spacecrafts in 1979 revealed that, in contrast to all other known moons, this moon has absolutely no impact craters. Instead, it is covered with sulfuric compounds that are responsible for its colorful surface. Volcanoes pervade the surface of Io. Some are even taller than Mount Everest. Eruptions are almost constant, repeatedly covering the surface with volcanic material and erasing any previous record of impact craters. Io is the most volcanically active world in the solar system. When Voyager 1 flew past Io, it detected nine volcanoes erupting simultaneously! The “gravitational stretching” occurring every 3.55 days, when Io passes between Jupiter and Europa, seems to provide the internal energy required for Io’s volcanism. Galileo’s telescope was quite small and limited—comparable to modern binoculars. In the centuries that followed, astronomers discovered many additional fainter, smaller moons with the aid of higher-quality telescopes and spacecraft. At latest count, Jupiter has 67 known moons—more than any other planet!6 Aside from the Galilean satellites, all these moons are very small, generally only a few miles across. Jupiter also has a system of rings like Saturn that were first detected in 1979 by the Voyager 1 spacecraft. These rings are much less substantial than Saturn’s, however, and too faint to be seen with a backyard telescope. The main rings consist of dust particles orbiting mainly around and inside the orbit of Jupiter’s innermost moons, Metis and Adrastea. An even thinner “gossamer ring” extends farther out. Most of what we now know about this fascinating planet was hidden from humanity for thousands of years. To our distant ancestors, Jupiter was a bright point of light in our night sky. Who would have imagined that this bright “star” would have so many remarkable characteristics? And what other celestial secrets has the Lord hidden for us to find and cherish? Belts are regions where we are able to see deeper into Jupiter’s atmosphere. Zones are lighter because they are clouds of ammonia that are higher in the atmosphere and block the brownish-orange color of the lower atmosphere. Hurricanes on Earth are low-pressure systems. The Red Spot in Jupiter’s southern hemisphere is a high-pressure system. For this reason, it rotates counterclockwise—in the opposite direction of hurricanes in Earth’s southern hemisphere (which rotate clockwise). Galileo published his discoveries in 1610 in a small, enjoyable book called The Starry Messenger. Galileo’s sense of wonder and excitement are obvious throughout. He knew that he was seeing something that no human being had ever seen—something that would forever change our perceptions of the solar system. Galileo challenged a number of the prevailing scientific views of the day. Curiously, the Roman Catholic Church had largely adopted the mainstream scientific view of the day (geocentrism) and incorporated it into their theology. They even attempted to use poetic passages in Scripture, such as Psalm 93:1, as evidence for geocentrism. However, such passages were ripped out of context. The psalmist is not addressing motion in the sense of Newtonian physics but rather the inescapable stability of the universe caused by the power of God. Many people think that the Galileo incident was an example of science prevailing over Scripture when in fact it was one view of science prevailing over another view that the Roman Catholic Church had endorsed. Perhaps the lesson to take away is that we should not tie the Bible to any specific scientific theory but instead let Scripture interpret Scripture. A resonance is when the ratio of two periods can be expressed as a simple fraction or integer, such as 1-to-1 or 3-to-4. In this case, the inner three Galilean moons have an orbital resonance of 4:2:1. That is, Io orbits four times for every two orbits of Europa and every one orbit of Ganymede. In this Impact series, we first explored the concept of resonance in the article on Mercury in the August 2013 issue of Acts & Facts. Planets: Jupiter. Solar System Exploration. NASA. Posted on solarsystem.nasa.gov, accessed October, 2, 2013. Jupiter rotates counterclockwise as viewed from above its North Pole. When one massive object passes closely by another, their mutual gravity will affect their orbits. In some cases, this can result in one of the objects being ejected from the system. Cite this article: Jason Lisle, Ph.D. 2013. The Solar System: Jupiter. Acts & Facts. 42 (12).